Yesterday our church took the Lord’s Supper. Detouring from the book of Titus for a week, we considered the significance of Jesus’s gospel-proclaiming meal. In my sermon on 1 Corinthians 11:17–34, we observed how Paul corrected the twin problems of (1) divisions at the Lord’s Supper and (2) indifference to the divisions with three solutions (vv. 17–22). First, he rehearsed the gospel of Jesus Christ by re-explaining to the Corinthians what the bread and cup symbolize (vv.23–26). Next, he called for all participants to examine themselves before taking of the meal (vv.27–32). And last, he challenged the church to “receive one another” as they came to the Table (vv.33–34). Paul’s view of the Lord’s Supper is a worthwhile reminder of how serious this meal is. He warns that when divisions go unchecked at the Lord’s Table, the church and its members eat the meal in vain (v. 20). While the bread, the cup, and the church may be gathered, it is possible that the people eat their “own meal,” not the Lord’s Supper (v. 21). Such a sober reminder calls us to examine our hearts and repent of anything that would bring division in the body of Christ. At the same time, those who are resisting sin and trusting daily in the gospel need not worry about taking the meal in an unworthy manner, as many earnest saints often do. The warning is directed to those resisting repentance, not resisting sin. On this point, Ray Van Neste offers a helpful corrective about the meaning of 1 Corinthians 11:28. 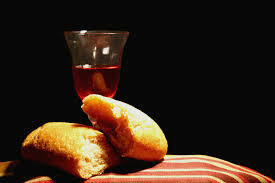 All in all, the Lord’s Supper is a vital part of the Christian experience. It calls the hard-hearted to repentance and it invites the broken-hearted believer to taste afresh the grace of God. Sadly, it has been misunderstand and misapplied in too many contexts. Hence, the reason why we considered it yesterday. At the same time, for those interested in diving deeper into the theology, history, and practice of the Lord’s Supper, let me encourage you to pick up The Lord’s Supper: Remembering and Proclaiming Christ Until He Comes, edited by Thomas R. Schreiner and Matthew R. Crawford. As I preached on 1 Corinthians 11, I found Jim Hamilton’s chapter particularly helpful.